The Aintree Grand National is with us once again, bringing with it all the excitement of watching 40-odd horses gallop round a course that is too long, over fences that are too high, and too dangerous, and stagger their bedraggled hulks past the finishing post, sweating profusely, gasping for breath and frothing at the mouth, like rabid beasts of the Apocalypse. 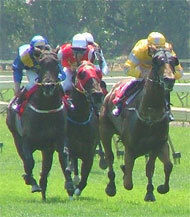 Several horses, which were prized thoroughbred animals going into the race, will fall, and break legs. Some may have to be shot. In the head. Looking on the bright side, many of the horses will not die, and one will eventually win, despite having a man on its back for the duration of the race, digging his heels into the horse's flanks, and using his whip to coax it on. Some people think the race is cruel, due to the 4-mile distance, the height and dangerous nature of the fences (Becher's Brook, the Chair), and the jockeys' harsh treatment of their mounts. You could win some money if you pick the winner though!